The entire Novotel Valence Sud hotel team wishes you a warm welcome. Relax on our riverside terrace, savor a Sunday morning brunch or enjoy our monthly Jazz&Lounge evening from 7:30pm. Entrance fee applies. Just 3 minutes from the city center, organize your meetings in the intimate "Salon" room or the eight modular rooms at the Novotel Valence Sud hotel. After a productive day of work, unwind in the sauna, take advantage of the fitness room and swimming pool, and enjoy local specialties from our restaurant in the veranda or on the riverside terrace. The hotel also features jazz evenings on Thursdays and brunches every Sunday. 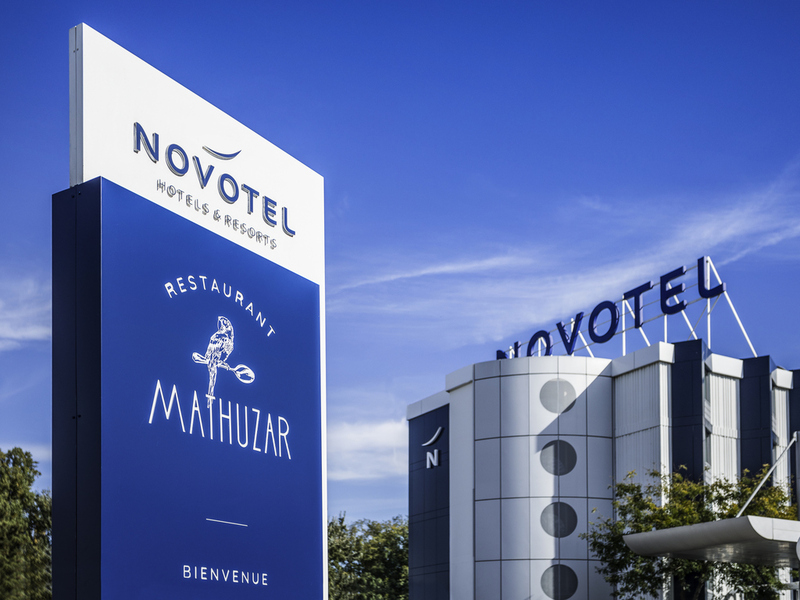 The Novotel Valence Sud hotel: 106 rooms, a riverside restaurant, a sauna, a fitness center and Tesla charging terminals, as well as monthly Jazz&Lounge evenings (entrance fee applies) and brunch every Sunday morning. All especially for you. Discover healthy, balanced cuisine with our suggestions of the day and enjoy famous Rhone Valley vintages on the riverside terrace or the veranda. Indulge your taste buds against a backdrop combining design and nature. Booking recommended for dinner. In spite of the considerable efforts of the hotel staff, there remains an important problem in this hotel: the absence of a wifi network without security issues: I have signalled many times in the past: for a hotel focused on business customers is is not acceptable that the wifi tries to track you in such a measure that my company's webmail front-end rejects the connection. Room and hotel in general was very clean and comfortable. This was our third stay at this hotel on our regular drive to our house in Spain. The bar area is poorly managed, not very friendly and over priced which is a shame. The rest of the hotel is good. Fantastic welcome by Roberta, Good bed, loose toilet seat, lots of dust in the room. Good breakfast buffet but surroundings not very clean ex. : buffet fridge doors, Windows... Plenty of Service staff discussing... but not present for the guests. Friendly and efficiënt check-out. A good hotel with pleasant, friendly staff and plenty of parking. We have stayed at this hotel 5 times now either in late Autumn or early Spring and it is sometimes fairly busy, last time with cyclists heading for the Med coast, but the facilities accomodate this with no problem. I would imagine in the summer peak season if the hotel is full then the facilities might be stretched. We have always eaten in the hotel restaurant because we have been driving all day and too tired to go out. At dinner if you want just a glass of wine, the staff hand you the speciality Rhone wine list which is in my opinion far too expensive. On the back of the regular menu (i.e. not the specials of the day) there are far more reasonably priced wines by the glass and from other regions of France, which for us is better wine for less than half the price. The dinner menu can be a bit off-beat but ok. I do however not like the scrambled egg at breakfast which for me appears to be greasy. If you have the time I imagine the kitchen staff will cook you something to order, but we want to get back on the road so don't bother. When in the car park we have seen several guests leaning out of their room windows smoking which the hotel does not allow, and on one occasion we had to change our room because of the stale smell of smoke, which was not the hotel's fault. Very happy with overall service and facilities. Professional and pleasant very helpful reception staff. Equally restaurant service was efficient and friendly, food quality good. It was short but very pleasant Will stay there again when I am in the area. Fine, but as mentioned above no recognition of Accor member status. . . what is point of such membership if no additional benefits. Otherwise, everyone was very kind. Comfortable room. Friendly helpful staff. Good restaurant. City breakfast at 8 euros was a good option when you don't want a full buffet breakfast. Unfortunately the weather was not good, so we were unable to take advantage of the hotel being by the water's edge.